A larger-than-life walking man stands as an icon atop formidable granite cubes at the entrance to this station. 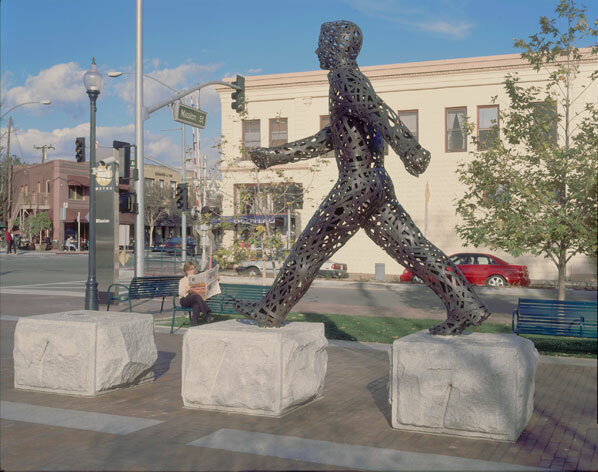 Made of annealed bronze strips that have been welded over a supporting armature to create a woven latticed form, the figure represents a unique community that is determined to move forward in its own distinct way. Situated in a corner vest pocket park that adjoins the station, the scale of the 10-foot figure with its familiar posture creates a looming presence over the area. The figure accentuates the pedestrian nature of the Mission Street area, and encourages commuters to disembark and visit the diverse shops and restaurants within walking distance of the stop. The dark patina of the figure is set against antique white granite blocks that were once part of the Arroyo rail bridge. As the figure strides effortlessly yet purposefully on its elusive journey, sunlight darts through its woven surface, creating patterns of shadow and light on the pavement below. The image of the looming figure can be likened to the trunks and branches of the majestic oak trees that surround it, forming a relationship between nature, the pedestrian, and the arrival of light rail in this neighborhood. The artwork harkens back to a time of grand monuments, but in this case the importance of the common man is heralded. MICHAEL STUTZ began his journey as a public artist creating temporary recycled cardboard installations. His first permanent public sculpture was for the W Hotel adjacent to the San Francisco Museum of Modern Art. Since then, he has completed a number of public commissions in cities throughout the US including Portland, OR, and Salt Lake City, UT and is currently working on pieces in Jacksonville, FL; Richmond, VA; San Jose, CA; Ventura, CA; and San Francisco, CA.